Senior drill instructor U.S. Marine Corps Staff Sgt. Jason May makes an amazing speech to new recruits on pick-up day aboard Marine Corps Recruit Depot San Diego, California. May spoke to the new recruits about what his and the other drill instructors responsibilities will be as well as what he expects of them during the 13 weeks of recruit training. May conducts the speech in the exact way one would picture a speech being made by a senior drill instructor. A drill instructor is a non-commissioned officer in the US armed forces, with the duty of training new recruits joining the military. Drill instructors have different titles in different divisions of the armed forces. Only in the Marine Corps they are known as ‘drill instructors’. Being referred to as ‘Drill Sergeants’ may be taken offensively by U.S. Marine Corps Drill Instructors, since it is a term strictly used in the American military, just as Marines may be offended at being called “soldiers”. Doing this intentionally is considered a grievous insult. 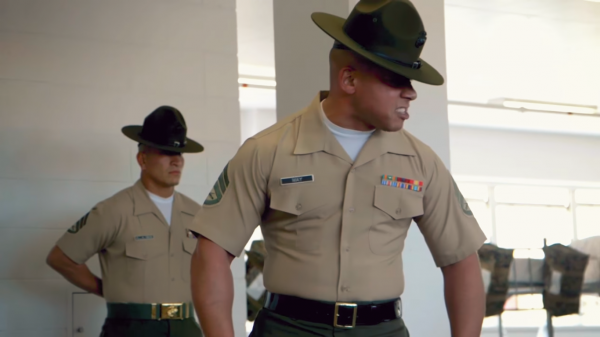 The only acceptable address of a drill instructor by a recruit is “sir” or “ma’am.” At Officer Candidates School (OCS), candidates are instructed by Drill Instructors who have already served a tour at one of the Recruit Depots. Officer candidates address their instructors as “Sergeant Instructor” (and rank and last name), or “Platoon Sergeant” (and rank and last name). Marine boot camp is a rite of passage for the new recruits, and drill instructors are usually feared by all. The main job of a drill instructor is not only to make recruits combat-ready but to instill values and discipline in them. 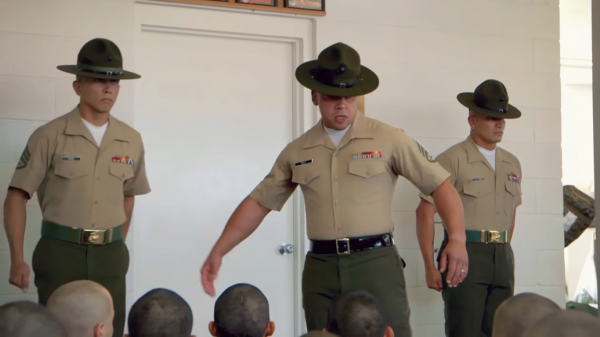 Drill instructors say that recruits come from all walks of life, and many of them have no standards, discipline, or values. They must be prepared in those 13 weeks. In order to be a drill instructor in the Marine Corps, candidates must have served a minimum of one full four-year enlistment in the Marine Corps. They must also hold the rank of sergeant or higher, and be able to pass the required physical fitness tests and medical examinations. Besides this, they must be recommended by their superiors. Drill instructors are trained at Drill Instructor School for 12 weeks during which they learn to train recruits on subjects like military history, physical fitness, drill marching, swim qualification, and leadership training. Navy SEAL Veteran Running For Governor Is Selling "ISIS Hunting Permits"